The clothes of Orient Textiles are of big quality and their prices are sensible.The company offers designer wear fabrics and printed fabrics.Orient Textiles s launched its Latest Exclusive CLASSICAL lawn Collection 2013 3rd Volume For Women & Girls who love trendy dresses. This collection is very stylish & sophisticated. This collection totally consists of lawn fabrics. The fabrics for most of the shirts in orient classical summer lawn collection 2013 volume 3 for women consists of 3 mater lawn fabrics. Here we have collect some fabulous designs from a latest summer lawn collection 2013 of Orient lawn outfits for our valued visitors. Orient Lawn Volume-03 designs are include Ikat Jaal, Scroll, Floating Paisley, Ikat Grace, Ralli Look. All the dresses are very charming and stylish suitable for casual, formal and evening party wear fashion for girls and women’s. 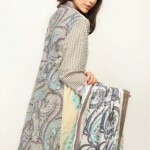 In this collection shirts and dupattas are printed and mostly the shalwars are plain. Therefore, you can prepare loose shirts, stylish frocks and A-line shirts from Orient Classical summer lawn collection 2013 volume 3 for women according to the present fashion and trend in the country.